Pretty and vapid, but mostly just pretty vapid. Made for only the most easily entertained and those not irritated by full-blown Minion mayhem. Considering their popularity, it was only a matter of time before the Minions got their own movie. After sharing the spotlight as Gru’s loveable henchmen through two Despicable Me movies and a theme park ride, directors Kyle Balda and Pierre Coffin are giving them their due. But what could we possibly want out of a movie revolving around a bunch of walking Tic Tacs who don’t even speak a real language? It’s certainly not what’s delivered here. Instead, Balda and Coffin treat audiences to a borefest with too many jokes that will fly over kids’ heads, while serving up lame slapstick jokes, leaving the rest of us just feeling tortured. Imagine my disappointment considering I own both Despicable films on Blu-ray, and in 3D, to be so tuned out of the onscreen antics that all I could do was critique the image and animation. Yes, you do want your movie to look as good as you can, but that shouldn’t be the only memorable aspect. Alas, the Minions are here to invade your wallet and continue to push Universal’s box office numbers even higher, whether the product is worthy or not. Like all good origin stories, Minions introduces us to our yellow protagonists where we follow their evolution through the age of the dinosaurs to run-ins with cavemen, pharaohs, Dracula, and Napoleon. All they want is to serve the most villainous boss they can find. Problem is, they always wind up accidentally killing them. The Minions wind up taking shelter in an ice cave, but Kevin (all Minions are voiced by co-director Coffin) decides to embark on a mission to find a new master, taking with him Bob and Stuart. This leads our trio to New York City in 1968, where they hitch a ride with Walter and Madge Nelson (voiced by Michael Keaton and Allison Janney) to Villain-Con in Orlando. Here, they manage to win the role of sidekicks to Scarlett Overkill (voiced by Sandra Bullock) who takes them to England where she informs them of her plan to steal the Queen’s crown, with the help of her gadget-engineering husband Herb (voiced by Jon Hamm). Surprisingly, this is a star-studded voice cast. The bad news is that none of them are given anything remotely entertaining to do. In fact, the only voice that stands out is Janney, not even Keaton is recognizable. However, the worst of the bunch is the one with the most lines of dialogue: Bullock. Let’s just say that she’s been known to sleepwalk her way through some pretty bad live-action roles, but here she’s more boring than ever. She never once sounds threatening. Considering her character is the main antagonist, she needs to ooze with ruthlessness. Something her co-star Jennifer Saunders did spectacularly — and hilariously — in Shrek 2 as the wicked Fairy Godmother. But here, even she is wasted, but not as horribly as poor Steve Coogan, who gets one scene. The only shining moment comes in the last scene when we finally get a taste of the film being a true sequel as we meet a young Gru (voiced by Steve Carell). I’ve already mentioned that I am a fan of the first two Despicable films, but this comes nowhere near to being as much fun as either of those. Thankfully, it never gets as intolerable as Illumination Entertainment’s worst endeavor, the ill-conceived abomination that was The Lorax. If they were to make a Minions 2, it might fare better considering they’ll finally be in another movie with Gru. 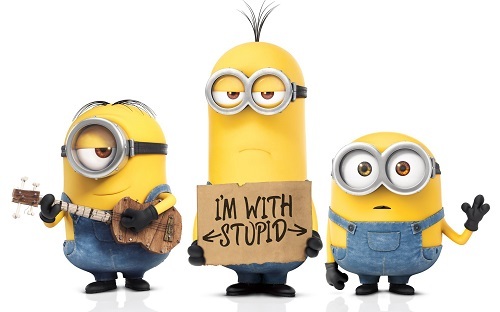 At least we won’t have to wait that long with Despicable Me 3 already slated for 2017. Both kids and parents will find themselves bored, except for the most easily entertained. Even the most hardened Minions fans will walk out disappointed. Needless to say the 14-minute ride at Universal Studios is more fun than the whole 91 minutes here.